When I grew up cell phones were a newer thing that only the wealthy could really afford. The rest of us used home phones and pay phones when were out an about. If there was an emergency while we were on the road we would have to stop at the nearest pay phone to make a call. This wasn’t always ideal or possible many times. There was a time where were in the middle of the country in Ohio and my mom’s car broke down. We had to walk a few miles to the nearest house to ask them if we could use their home phone. Not every house was welcoming to strangers who come walking off the road in the middle of nowhere. In a grid down situation many of us will be forced to be without communication. We will be unable to reach loved ones if we are stuck in a certain area and unable to make it out. Some of us will be unable to contact emergency services if they are even still available. Pre-cell phone days there were people who were smart enough to have some sort of two way radio. Most of the time it was either HAM radios or CBs. These people were always ahead of emergency situations and were able to keep in contact with loved ones. In a grid down situation many HAM radio operators will be one step ahead of the curve. When you first get into the preparedness movement you will hear many preppers tell you that you need to have a HAM radio. However, many don’t explain why or what can be done with a HAM radio. After purchasing the Baofeng UV-5R I have completely fell in love with HAM radios and see many useful purposes in a SHTF scenario. In a grid down situation cell phones and even landlines will not be operable. This can be due to an EMP attack or even just a natural disaster like a hurricane. HAM radios can be virtually unaffected by this scenarios if proper preparations are taken. To protect a HAM radio from an EMP attack you can keep it in a Faraday cage. In the case of a natural disaster you will want to keep radios in multiple locations. HAM radios are not bound by wires. They use antennas to broadcast into the airwaves to communicate. Now most of them are limited to shorter distances than a cell phone but can reach further distances through a repeater. In either case you should be able to contact a fellow HAM radio operator or local emergency services. During Hurricane Katrina HAM radio operators in New Orleans were recognized heroes. Many of them were able to communicate with emergency services to assist with search and rescue missions. There is one story how HAM radio operators were able to assist in the rescue of 15 people as they were unable to get through the overloaded 911 system. Now there are some other two way radio alternatives including CBs (Citizen Band) and GRS radios. However, the distances of those radios are very limited compared to a HAM radio. A portable HAM radio like the Baofeng UV-5R can typically reach anywhere from 5 miles up to around 10 miles. However, by connecting to a repeater you can reach up to around 25 miles. This is just a portable HAM radio. There are more powerful options that can actually reach other parts of the globe. You can go to www.repeaterbook.com to find repeaters in your area. 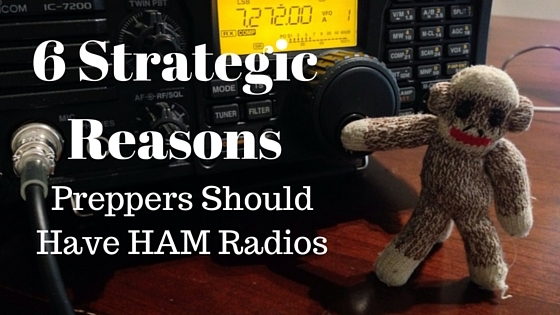 When you think of HAM radio operators you will probably associate them with preppers. However, this couldn’t be further from the truth. In fact, many HAM radio operators get very annoyed with preppers because they neglect many of the rules and laws associated with operating a HAM radio. However, most of the HAM radio operators are really big on preparedness. Instead of taking a holistic approach they focus mainly on radio communications. Then you have some other HAM radio operators who just see it as a hobby. Now with those that are focused on preparedness you can still build relationships with. In fact, my opinion is that it should be a priority to build relationships with them so that you can have someone that you know that you can communicate with when SHTF. That way you have a trusted source. Many times you can find ARCs (Amateur Radio Club) or ARES (Amateur Radio Emergency Services) in your area by searching online. They typically have monthly meetings that you can join. Some of them will even cover your cost of taking the test that you need to take in order to become licensed. In a SHTF scenario or post collapse society you will have to prove your value. Many will be killed off or robbed unless they can prove a reason to be kept. Operating a HAM radio will be a great skill that will be valued among many. You will be able to help them communicate to friends and family in other areas. You will also be used to gather intelligence. Along with the previous point it would be good to have a prepper group that you can trust when SHTF scenario. If you are fortunate enough to build a prepper community then you can set up a Comms plan. You could plan what frequencies to communicate on. If you could build your own tower it would prove to be a profitable investment when SHTF. In a SHTF scenario there will likely be enemies spreading propaganda trying to lure out any resistance and also build trust with the community. They will most likely take over local radio stations to pump out the propaganda. In this situation it will be valuable to be able to communicate with other locals to get a better understanding of the situation. Getting started with HAM radios is not expensive at all. You can begin with the Baofeng UV-5R to help you study for the exam and practice your skills. In a previous post I wrote about how to use the Baofeng UV-5R as a guide. From there you can build a base station at home or even a bug out location. Either way if you just have to basic knowledge and skills it will still give you an advantage to help you thrive when SHTF. One final reminder is that DO NOT PRESS PUSH TO TALK if you don’t have your license! You can face some expensive fines and piss off a lot of other HAM radio operators. Please leave any suggestions that you have in the comment section below. Your feedback helps the prepper community.